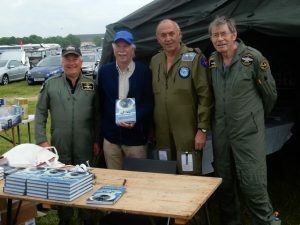 Bob Tuxford took a break from the take off demonstrations to be in the Victor tent to promote and sign copies of his autobiography ” Contact”. 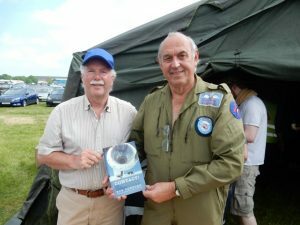 His publisher, John Davies, of Grubb Street Publishers, was on hand all day selling copies. In fact, John enjoyed himself so much he aims to be back for the August Open Day. Glyn and Mike were on hand lending support and adding their signatures when requested. In the early hours of the 10th May 1973 Victor SR2 XL230 of No 543 Squadron crashed during an approach in bad weather at RAF Wyton. Unfortunately all 6 crew members were killed. 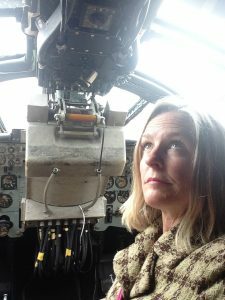 The Copilot was Flight Lieutenant John Phillips and his daughter, Hannah, who never knew her Father, contacted Chris Long, a friend of John’s from pilot training and the squadron, to discover more about her Father. 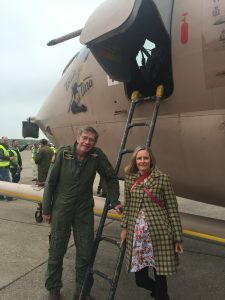 Chris was able to get a number of No 543 Squadron colleagues with personal reminiscences in contact with Hannah. This culminated in a visit by Hannah and partner Greg to the CWJ Open Day on the 29th May. Hannah was given a guided tour of Teasin’ Tina by Mike, who also served with John. In a former life XM715 was also an SR2 on No 543 Squadron. 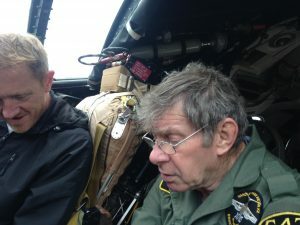 Hannah spent time in the cockpit in the seat her Father would have occupied and looking at the view he would have had. It was a privilege to facilitate such a poignant event. During the CWJ Open Day members of the Tina team were selling raffle tickets at their merchandise tent. 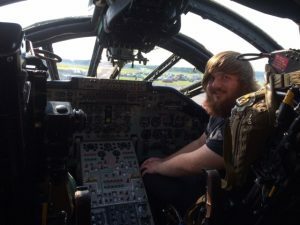 There were several attractive prizes, but the first prize was the opportunity to sit in the pilots seat of Teasin’ Tina and be given a comprehensive briefing by the flight crew. The winner, Jack Galley, said he was not expecting to win as he has never won anything before so it was a total surprise to him. He thoroughly enjoyed the whole experience including the free careers briefing from Glyn. The attached photos indicate his delight and we intend to repeat the raffle during the August Open Day. 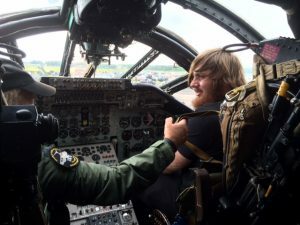 So this could be you in August sitting in the cockpit alongside the crew. Tickets and our merchandise will be on sale in our tent in the concessionary area.